Viewers surely heard the following phrase at least once from their mother or doctor, “eat your fruits and vegetables”. It goes without saying that these food groups are key to a well-balanced diet and consequently good health. In fact, a diet rich in fruits and vegetables is said to reduce cancer and other chronic diseases as they provide essential vitamins and minerals, fiber and other substances vital to health. Reality now is different for many though, if not most of us, as we do not eat nearly as much vegetables and fruits as we need. Part of the reason is plain-many people don’t enjoy eating fruits or vegetables. Another reason is the cost. Prices are often high and fluctuate at certain times of the year as well. What causes this? This is the focus of a three part story we have been working on, trying to find out why the cost of one of the most important part of our diet, vegetables, is unstable. Tonight we take a first look into our investigation. Dalila Ical reports. We start our investigation into the high cost of vegetables here at the market, the place where consumers have their pick. For the most part, the public can access most vegetables, some of the more popular ones being onions, potatoes, sweet peppers, cabbage, cilantro, tomatoes and beans. Throughout the year, the prices are unstable. During the last part of 2013 the price of tomatoes surpassed three dollars a pound. Retailers say this trend trickled into 2014. But what contributes to the rising costs at the market? Vendors say the most common reason is a poor supply to the local market. 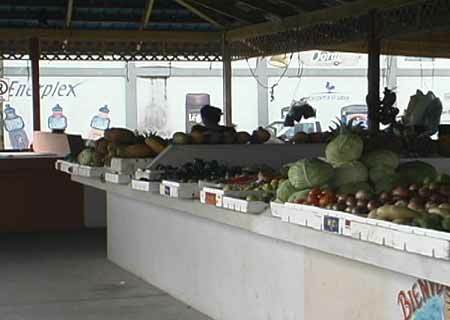 District Agriculture Coordinator for Corozal Barry Palacio explains that the demand was not met in 2013 as a result of very little local production due to the weather. There is no doubt that in 2013 the weather was rather unseasonable, but the fact is that unstable prices at the market have been the trend every year. Palacio stresses that the major culprit, again, is the weather. Another factor that contributes to the high prices is that some people are simply advantageous. One vendor shares her experience particularly on tomatoes. For some vendors though, keeping the cost of vegetables as reasonable as possible is important. This is only one side of the story. Producers, the Agriculture Department and even importers play a role in the industry. While scarcity of vegetables at certain points of the year is the biggest reason for the hike in prices, there are factors that contribute to that scarcity. We’ll delve more into that part of our investigation in our subsequent newscasts and even take a look at how contraband affects the industry and the cost of your vegetables.